ANZ was Principal Partner of Sydney Gay and Lesbian Mardi Gras for the second year running in 2015. 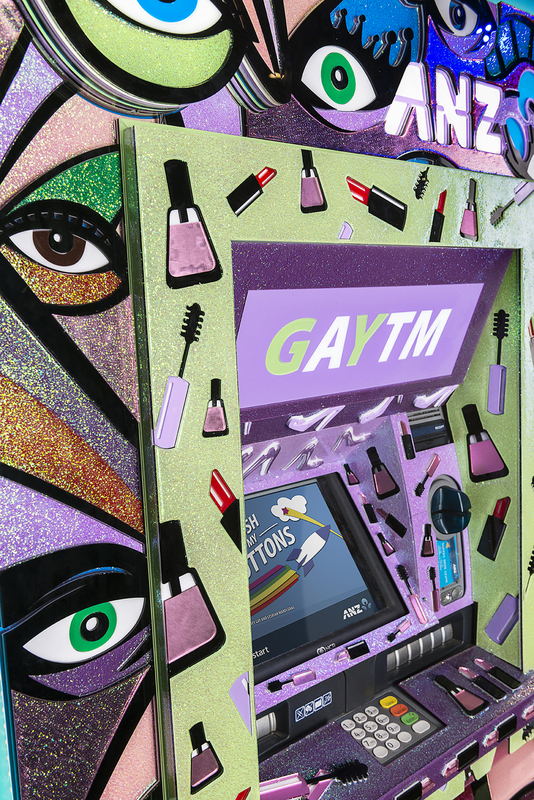 This year, we took GAYTMs to a whole new level of detail and complexity. Over 10,000 individually laser-cut acrylic sheets were painstakingly layered by hand to gradually form intricate 3D designs. Other materials in the designs included nail glitter, mirrored tiles, velvet, fur and leather. Each GAYTM featured LED lighting, custom-built lightboxes and motion-activated music and compliments. They also dispensed rainbow-coloured receipts and screens displayed messages like ‘Hello darling!’ and ‘Push my buttons’. All transaction fees were donated to a LGBTI charity. Sydney tour buses were re-routed to pass the GAYTMs.